A New Villain for ‘The Avengers’ Revealed? / It's Just Movies A New Villain for 'The Avengers' Revealed? A New Villain for ‘The Avengers’ Revealed? We still know very little about the highly-anticipated movie “The Avengers,” but some pieces have been falling into place. We already know the amazing list of heroes in the movie (well, most of them), such as Iron Man, Captain America, Thor, Black Widow, Hawkeye, (Hulk, hero or villain?) and more. But who is going to be the big baddie to go up against the unstoppable team? If you stuck around until after the credits of “Thor,” you would have discovered Loki — Thor’s half brother — got his hands on the Cosmic Cube, which means he is going to be a powerful adversary. But now the kind folks over at Latino Review say a very reliable source has revealed to them another villain that will appear in “The Avengers:” Thanos! 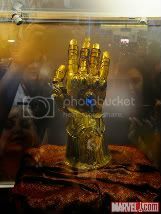 Now, we must add that clues about his possible appearance have been cast our way for a while now, like the an exact replica of Thanos’ gauntlet on display at last year’s San Diego Comic Con (pictured), and, going back to “Thor” (which I hope you have already watched), the gauntlet was on display in Odin’s vault. So, what do you think about the addition of this powerful villain? If you are not familiar with him, I recommend you Wikipedia him. You might be surprised, he’s been around for a while. Check out the replica of Thanos’ gauntlet they created; it’s like the comic just came to life! It is identical, and I couldn’t be happier. Well, rant away in the comment section; we want to know what you think. And look for “The Avengers” next summer when they hit theaters on May 4, 2012. Sounds cool. Probably will be a cameo role to set him up as sequel villain. Thanos is awesome, but other sites reported long ago that the Skrulls are the main villains.